David S Goodsell was the overall winner of the 2016 Wellcome Image Awards for his painting of Ebola Virus that was created for the Molecule of the Month. He talks about his process in this video. The RCSB PDB Molecule of the Month by David S. Goodsell (RCSB PDB-Rutgers and The Scripps Research Institute) presents short accounts on selected molecules from the Protein Data Bank. Each installment includes an introduction to the structure and function of the molecule, a discussion of the relevance of the molecule to human health and welfare, and suggestions for how visitors might view these structures and access further details. This feature provides an easy introduction to the RCSB PDB for all types of users, but especially for teachers and students. It is used in many classrooms to introduce structures to students, and is an integral part of the protein modeling event at the Science Olympiad. It is not intended to be a comprehensive index to entries in the PDB archive, nor necessarily represent the historical record. The structures used to illustrate each installment are chosen at the discretion of the authors. 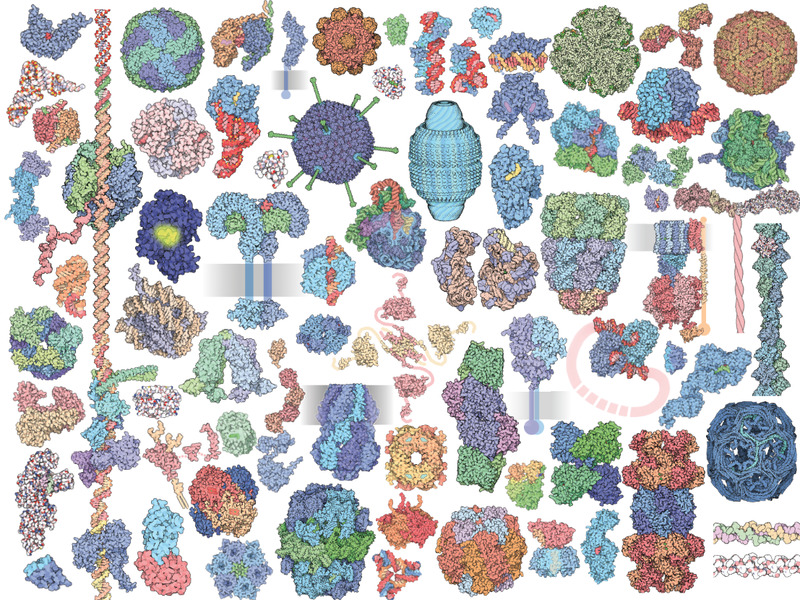 Goodsell describes the creation of these articles and images in an interview with the RCSB PDB Newsletter and in a 2017 Education Corner article. Citation and usage information is available. High resolution TIFF images are also available. Other institutions publish similar features, including the Protein of the Month at the European Bioinformatics Institute and Protein Spotlight at the Swiss Institute of Bioinformatics. Molecule of the Month is translated into Japanese by PDBj. Molecule of the Month images have been recognized by several awards and publications, including the 2017 NSF/Popular Science Vizzies (for Zika Virus), the 2016 Wellcome Trust Image Awards (for Ebola Virus Proteins), and the 2015 FASEB BioArt Awards (for Ebola Virus Proteins). David S. Goodsell, Shuchismita Dutta, Christine Zardecki, Maria Voigt, Helen M. Berman, Stephen K. Burley. (2015) The RCSB PDB "Molecule of the Month": Inspiring a Molecular View of Biology. PLoS Biol 13: e1002140 .